When my wife and I travel, Shelby always makes a packing list so that we don’t forget anything. I’m the opposite. I procrastinate until two hours before we leave, and I try to pack everything I think I will need. Typically what happens is that Shelby remembers everything, and I will forget at least three things that I needed to pack. Here is the moral of the story: make a list of what you need to bring to camp. My goal is not to write a blog about everything you need from enough t-shirts, socks, and underwear; rather, I want to write a list of the spiritual essentials you should bring with you to camp. So for the next few months, every time that I am writing I will be writing about what you should bring to help you experience Jesus in a deeper and more profound way. If you were to ask me the one thing everyone should bring to Lakeside it would be a Bible. When I say a Bible, I do not mean a Bible app on your phone or iPad or any other electrical device. When I say bring a Bible, I mean bring a Bible that has pages made of paper. Here’s why: when you use an electronic device as your bible, you will be tempted to check other apps or messages while you should be concentrating on God’s Word. Anytime that I have tried to use my iPad or Phone to study God’s Word, I always find myself distracted with messages and notifications scrolling on the top of my screen. I promise if you eliminate the opportunity for distractions, you will get a lot more out of your week at Lakeside. If you’re new to reading the Bible you may ask the question: what translation should I read? The best translation for you is the one you read and understand. However, the overflow of Biblical translations may leave you at a loss as to which one to chose. My hope is to help you understand the differences in translations and how to choose a translation that best fits you. Translation committees essentially take two approaches when translating the Hebrew (Old Testament) and Greek (New Testament) texts to English. Some committees use a process called formal equivalence, which means they translate the Scriptures word-for-word from the original texts (i.e. ESV, NASB, KJV). Other committees use the process called dynamic equivalence, which translates more along the lines of thought-for-thought (i.e. NIV, NET, NLT). Recently, there have been two more approaches to language translation: paraphrase (The Message) and optimal equivalence (i.e. HCSB, CSB, NRSV). Many people prefer dynamic equivalents, such as the New International Version or New Living Translation, because they feel that they are easier to read. While they are easier to read, you have to trust that the translators made the right interpretation for you. As a pastor and theologian, I prefer a word-for-word translation. The English Standard Version is my primary translation. I use it for personal study as well as the translation I preach from. I believe that as you grow in faith the more you want to move towards a word-for-word translation because you desire to know the exact words used in a particular passage you are reading. If I’m not reading the ESV, then I will be reading the HCSB/CSB (the CSB is the updated version of HSCB, which was released this year). 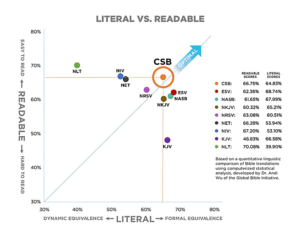 The CSB uses what is called an optimal equivalence approach, which means in the many places throughout Scripture where a word-for-word rendering is clearly understandable, a literal translation is used. When a word-for-word rendering might obscure the meaning for a modern audience, a more dynamic translation is used. If you’re someone looking for a translation, I highly recommend the CSB. When it comes to paraphrased translations, I really try to avoid them altogether. A paraphrase is a version in which the author expresses the Scripture in his own words. The most popular paraphrases are the Message and the Living Bible. While paraphrases can be helpful or inspirational, it is best to read them alongside an actual translation of God’s Word. Ultimately, there is no perfect translation as all have their strengths and weaknesses. Something I have come to realize in learning Greek and Hebrew is that you still have to interpret the text in some form when translating it into English. Again, the best translation is the one you read and the one that helps you know God in a deeper and more profound way. Let me make some recommendations. If you have never read the Bible or have found it difficult, try reading the Christian Standard Bible (CSB), New International Version (NIV), or the New Living Translation (NLT). If you have been reading a dynamic equivalence for a while now, try switching to a word-for-word translation such as the English Standard Version (ESV), the New American Standard Bible (NASB), the CSB, or the New Revised Standard Version(NRSV). Most importantly, just get into the Word of God. You’ll never be able to hear from God if you never open His Word. I can’t wait to see you at camp, and remember to bring your Bibles! May the Grace of the Lord Jesus Christ be with you! Thanks, Corey! I have never had anyone explain to me a rationale reason as to why to pick one translation over another. 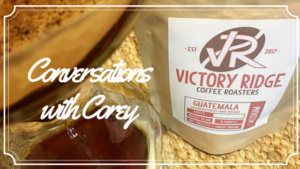 Great blog, Corey! Full of lots of great information, but even more importantly, full of inspiration and encouragement to bring and get into God’s Word. Looking forward to another year at camp!